Kathryn B. Atkinson was born on April 3, 1928 in Wilkes Barre, Pennsylvania to Andrew and Katozyna (nee Goach) Chorba. 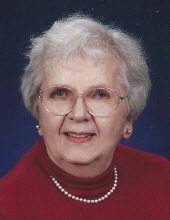 She died Sunday, February 3, 2019 at Lutheran Home & Services, Arlington Heights. Kathryn is survived by her children Richard (Sandra) Atkinson, Karl (Laurie) Atkinson, Bethany (Lawrence) Geyer, SuZane (James) Ray; her grandchildren, Jason (Hillary) Atkinson, Matthew (Shavonne) Atkinson, Chad (Colleen) Atkinson, Sara (Adam) Eccher, Katrina Atkinson, Kevin Atkinson, Cari (Jonathan) Scheck, Larissa Geyer, Nathaniel Ray, Daniel Ray, Margaret Ray, Melody Ray; her great grandchildren Cole, Isabelle, Embyr, Irys, Lyric, and Sage Atkinson, Zane and Hazel Eccher, and Joanna and Jeremiah Scheck; her brother, Luther (Sandra) Chorba; and her brother-in-laws, Paul Haberstock and Wallace William Atkinson. She was preceded in death by her husband Zane E. Atkinson; and her grandchildren, Saran Geyer, and Hannah Ray; and by her sisters, Dorothea Haberstock and Luane (late Michael) Wurn. Kathryn's family will receive guests from 10:00 am until the time of her Memorial Service at 11:00 am, Saturday, February 16, 2019 at Lutheran Home and Services., 800 W. Oakton Street, Arlington Heights, Illinois. In lieu of flowers memorials may be given to Lutheran Life Communities Foundation, 800 W. Oakton Street, Arlington Heights, IL 60004 or to St. Peter Lutheran Church, 111 W. Olive Street, Arlington Heights, IL 60004 or to Feed the Children, 333 N. Meridian, Oklahoma City, OK 73107. "Email Address" would like to share the life celebration of Kathryn B. Atkinson. Click on the "link" to go to share a favorite memory or leave a condolence message for the family.